So it’s the start of another project! I have to chose another word from the handbook and in three weeks start and finish the project that I decide on. After umming and ahhing I have decided to use the word ‘script’ this time. Here’s my draft project proposal and also time plan. For this project I have chosen the word “script” as a starting point as I am intrigued as to how I may be able to incorporate script, or handwriting into Fashion and Textiles. The idea is to use this research as inspiration for a series of textile/fashion drawings that can be developed into a physical form in the future. I will incorporate scripture into my designs by using the words as a guide for how a dress or outfit may be structured. For one particular design I plan to write a story or use one that is relevant as a way of furthering my main illustration, which I plan to be a dress that is covered in very small handwriting. As I only have three weeks to complete this project I have decided that I will not make any of my designs but focus on the design and research aspect. This way I can come up with a series of illustrations, which include complex and detailed figures that would take weeks to create. 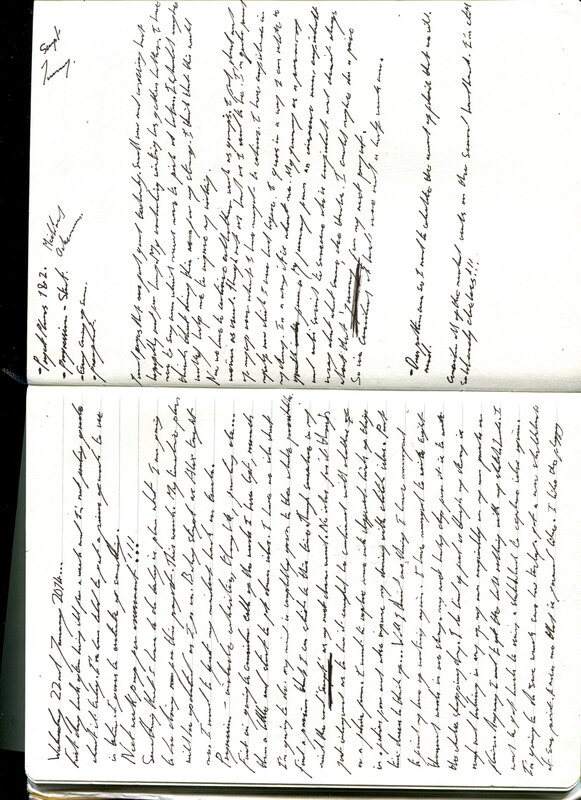 So in three weeks time I will have a body of research that includes pictured and drawings of scripture. Fashion illustration drawings along with some textile designs to develop these drawings. I plan to choose at least three drawings to be my final images. 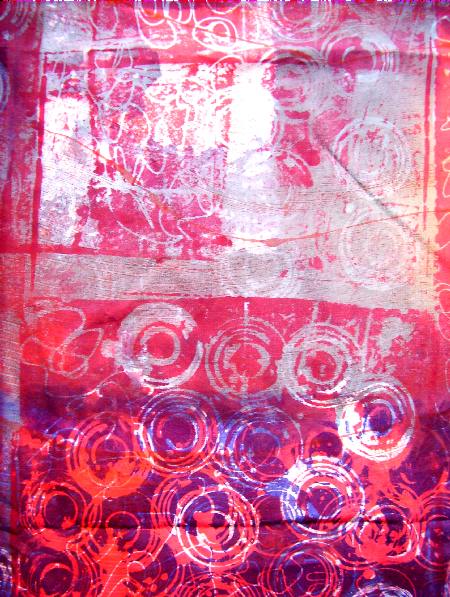 For these particular designs I will create a small square of manipulated fabric for each one. 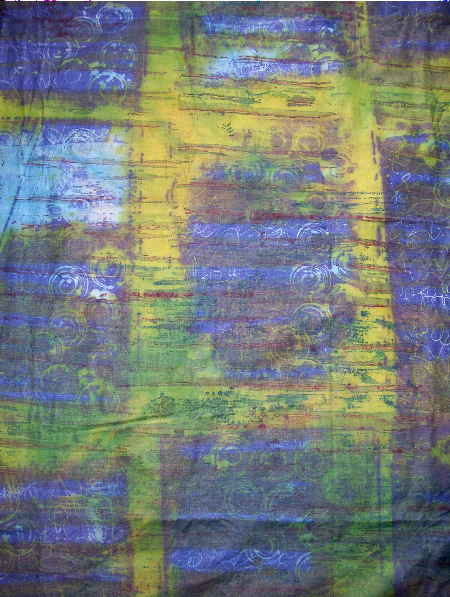 The fabric will be dyed, printed or even painted to be a sample page of how the design may look and feel in some kind of physical form. Type up project proposal and time plan. Start to explore ideas and research. Take some photos of scripture and continue research. Fashion and textile designs using research. 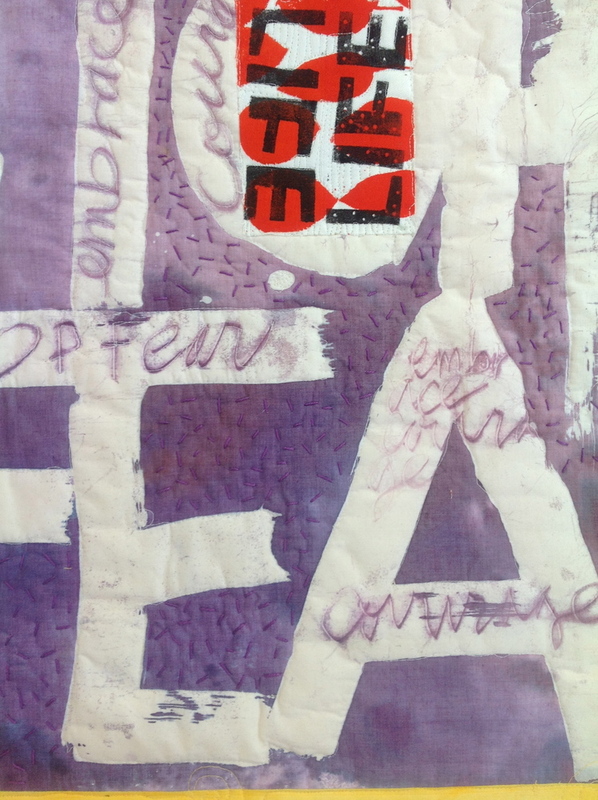 Fashion and textile designs and explore text in sketchbook. More drawing and picture taking. Finally images and ideas should start to emerge by then. Finishing up final series and creating fabric pieces. Finish up any left over work and make sure its all ready to be presented. Prepare for assessment and portfolio. Calligraphy is a decorative style of handwriting that allows us to be creative with lettering although many people who have tried it are disappointed with their results that they give up, as it appears to just be an extension of school taught handwriting. Those who stick with it though will appreciate the disciplined art. Journall…As no one can read my writing (another reason I am interested in fonts) I have decided to start posting it on here and commenting about it. Typing up any reflective stuff I can remember so that I can reference back to it. Firstly I write about how I have been Ill for a week (I felt so bad!) and listed all the thing’s that I was not able to do during those days. I will be making a timetable for my planner so that I can catchup with the end of my last project and finish it. I then go on to explore many ideas I could go into for each of the words to chose from. I felt that none of them would be that interesting though as I didn’t feel very passionate about any of them. Wether or not that was because I was still getting over being ill who knows…During the ‘Crit’ tutor session though. Halfway though I managed to get inspired into the right mindset after talking to other people about my work and theirs. I felt excited to get working again and felt better. Thats when my project proposal started to appear. The rest is a lot of rambling about my current writing project at home. As It’s only half way through today there is not much on todays page yet apart from my to-do list. I have recently started writing them so that I can focus on baby steps and cross them off one by one. This helps me to not rush through things and separate the projects I do into different sections. So far most of my list has been crossed of- the rest being after college work. 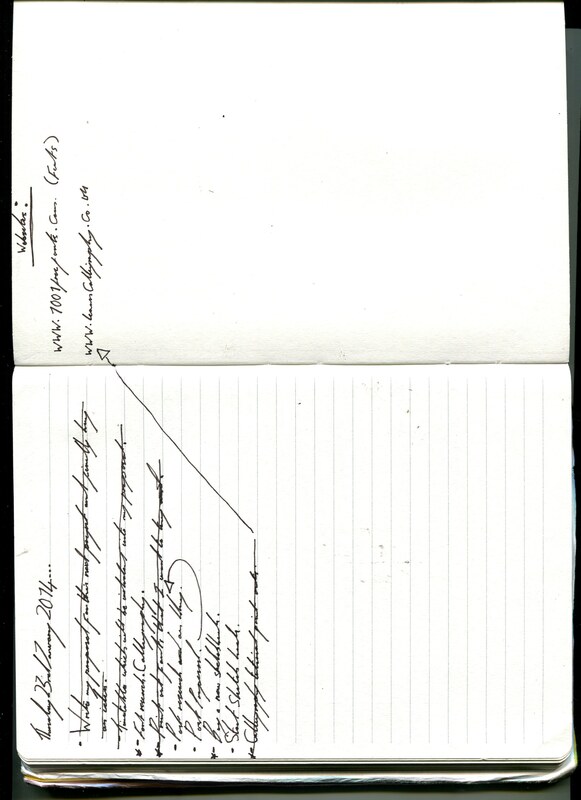 I have also started to record the websites I use for a bibliography. I came across this book in the library and found the introduction to be very informative. It’s a book all about the alphabet and the relationships with art, design, typography, children’s books, commercial signage and many more. It explores the idea that the alphabet can be a powerful tool and goes on to explore each and every letter individually. Though I have not read that far into the book yet. The introduction to the book is titled ‘The Amazing Story of Our Alphabet’ and is written by a man called David Sacks, who talks about a quote from English type designer, Eric Gill in 1940. Sack states that with modern type face this quote is true but the statement that ‘Letters are things, not pictures of things’ is completely wrong, as our letters in their Bronze Age origins actually used to be pictures. Our capital letter shapes began as pictures of objects and exist today as remembrances of these pictures. The letter ‘M’ with it’s wavy lines were meant to be the image of water(4,000 years ago) and the letter ‘O’ was originally a picture of an eye. It used to have and interior iris but has evolved to become the one outer circle shape we know today. A ‘H’ was the likeness of a face and used to be written with top and bottom horizontal lines, or bars. Who would have guessed that the “K” with its splayed lines used to be a picture of a hand? And the “A” In particular that of a triangular cow or ox face. If you turn it upside down that is. Originally the ox’s head picture was the first of the alphabet and was called ‘aleph’ which also means ox in the Eastern languages. Even today in Hebrew the first letter is still called an ‘aleph’. So the alphabet began as many pictured objects like an ox or a house. These pictures were not just random either as their names had to hold some kind of special quality. That is just the information that I have learned from the first page. I decided not to go any further into the research of the alphabet as It wont help much in inspiring designs for my project. Though I will continue to read through the book to learn more about the fascinating history. I had a long think about the path I want this project to follow. In my proposal I purposefully left myself the room the experiment and change my project as the time passes. I realized that in doing this I have also failed to really think, in depth about what my project is going to be about. Other than a Textile or Fashion piece that incorporates some kind of script. Yes, I have began to research and explore through my designs in my sketchbook, using text as a textile pattern for these designs, but I feel as though my project has no real meaning to it. So I have had a very long think about the road I am going to take with this project and decided that I want to connect it to myself in some kind of way. Make it more personal even if no one can see it. I want to take the word ‘script’ which is my starting point and look into it a connection that I may have with this word. So I though about how my life incorporates and kind of writing, besides my own and decided on the obvious. I am a huge book lover! I love to read in my spare time. On the bus. At lunch. I read every day. Getting lost into a whole different world and life for a while is an amazing escape when I need it. Learning about different characters and their life and watching them grow. I have always felt sorry for those who don’t read because they are seriously missing out on an amazing thing. An amazing connection between the writer, character and the reader. In a way its the same as going to a viewing of a piece of art. As a child I grew up listening to bedtime stories of Harry Potter by J K Rowling and have loved them my entire life. I’ve become a huge fan of the magical world of Harry Potter and always will be. I look forward to going to the Studio Tour in March. When I got older I re-read the books for myself and fell even more in love. As a result I have always felt that I can’t get into a book or book series as much as I did for them. A shame. Don’t get me wrong I still enjoy reading stories I just haven’t found that special something that has made it stand out to me in any particular way. That is until I watched the first Hunger Games movie. I was amazed by how good the story line turned out to be. At first I was doubtful that I would enjoy it as I have never really been that into gory fighting movies. I found that it was more about the communities than the fighting. They’re in the aftermath of a war where one community has been controlling another for whatever reason. So after watching I decided to try and read the books. I found that I became lost in the trilogy. I couldn’t put the books down and managed to finish them in two maybe three weeks. Anyway, I have decided that for whatever reason this story has spoke to me I want to explore it and find out why. This is the path my project will take. Susie Monday is an artist and teacher. 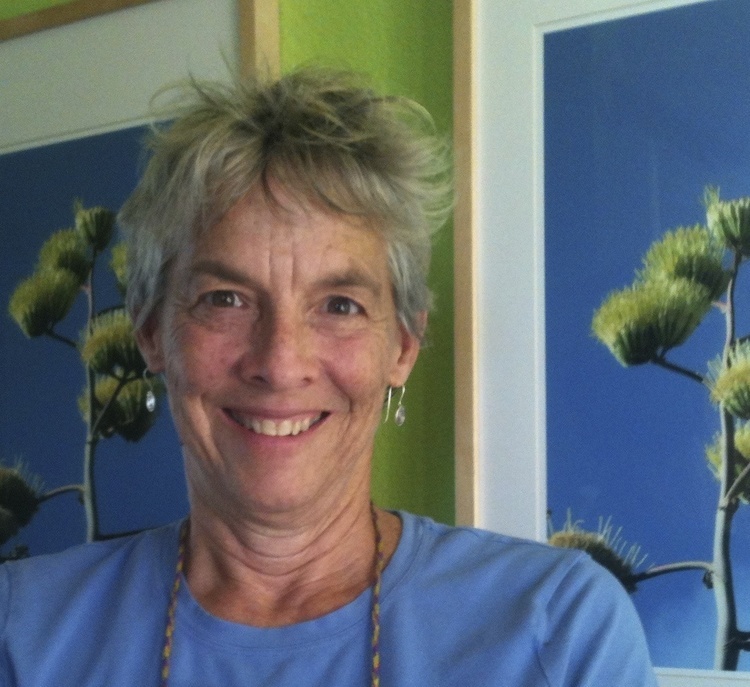 Her work is inspired by colours, different textures and images of landscapes near the Texas Mexican Border. She creates contemporary textile painting, surface designed art cloth and also mixed media art. She explains that what inspired and grabs her are the “conversations between colour and texture, and the drama of pattern in everything I see around me: the wind in the cedar trees below my windows, the Guatemalan and Mexican textiles in my studio drawers, the angels who come to me as I work”. She aspires for her creations to have consistency of style and to share her personal visions – and to fins a home on someone’s wall! The way she describes why she likes to work with fabric art really jumped out to me as I agree with it in reference to my own work. Like Monday I love that is allows more room for interests and experiments. Painting. Printmaking. Embroidering. Building and layering. Embellishment and collage. 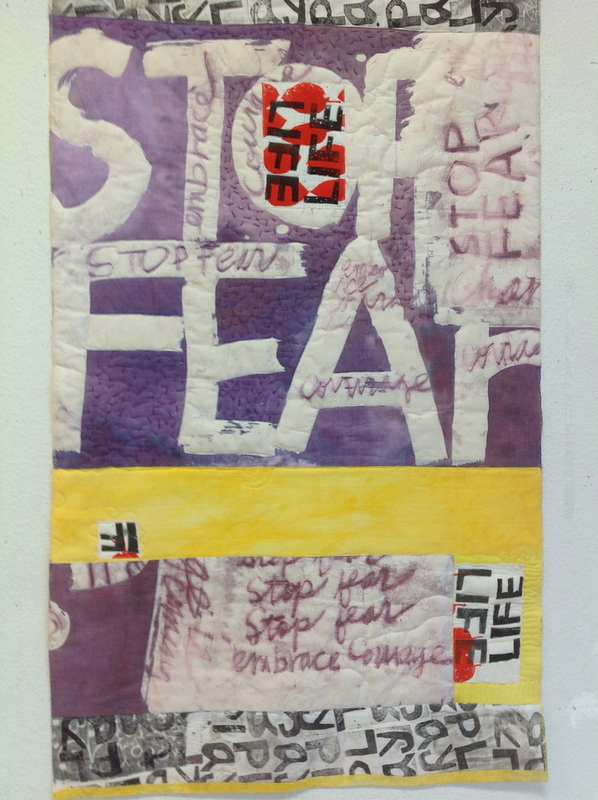 All of these different things allow the artist to incorporate hand-dying, stenciling, stamping, screenprinting, screen and hand embroidery and quilting into one piece of work. She says that she likes to work by cutting up “anything that comes to eye” and that she goes by the minds set “nothing us sacred and everything is”. She teaches a small grouped workshop on the weekends which include exploring creativity, art journaling, Ipad apps for artists, surface design techniques. She tries to combine these with looking into spiritual growth and practice as it affects the design process as well as creativity and the fine art of making a life true to ones strengths, girts and passions. She also teaches and conferences, events and schools around the world. 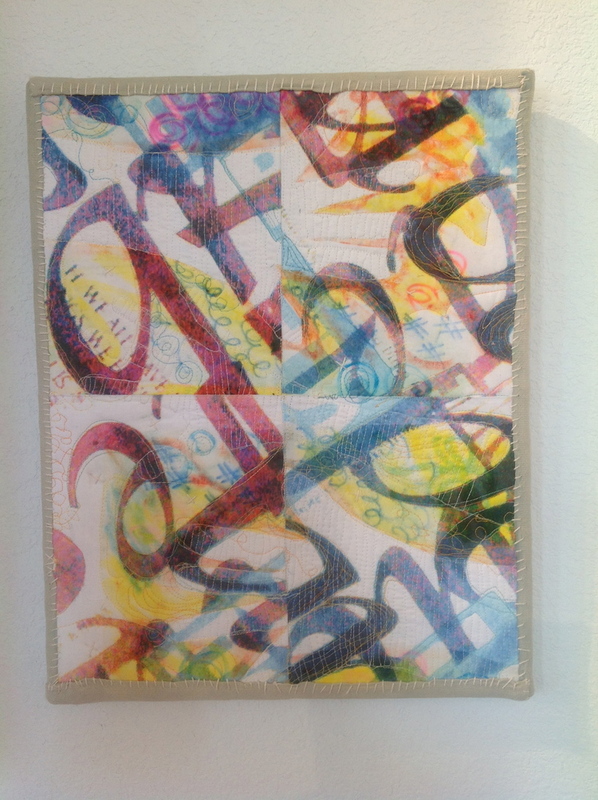 Monday says that she is fascinated with letter forms, language, found words and signs. 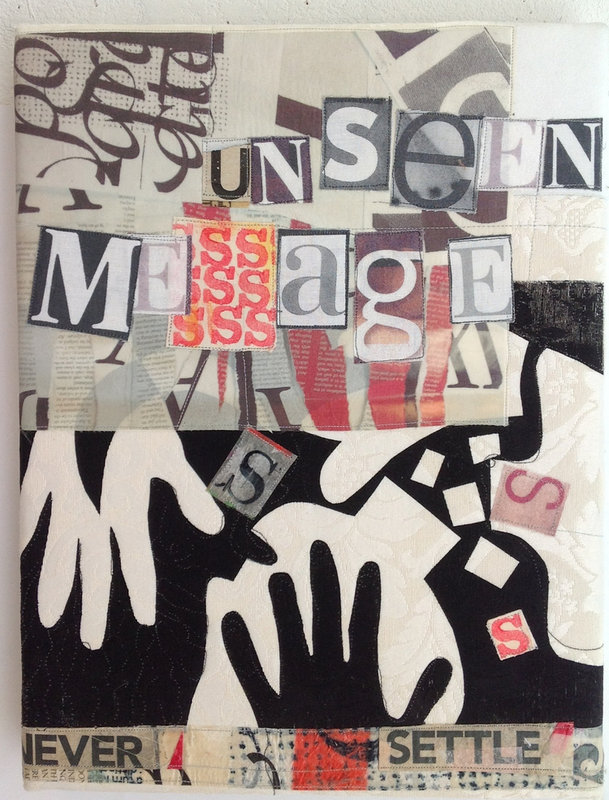 She uses text in her work in subtile ways but also not so subtile ways and uses a variety of surface design techniques. 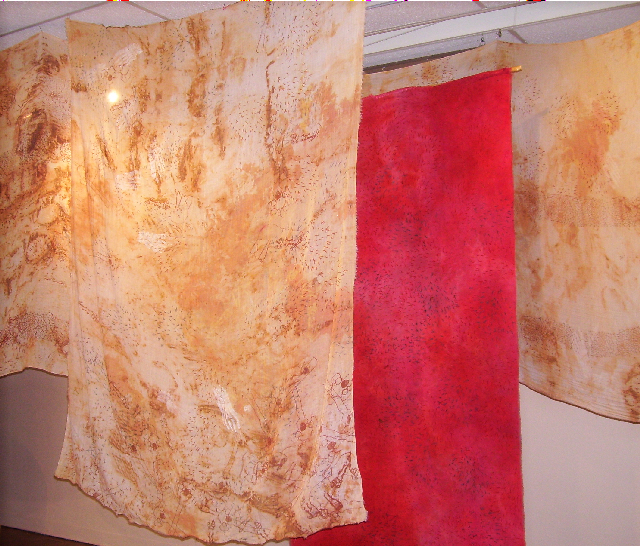 Her art cloth starts of as some kind of white fabric, usually recycled and worn table linens, cotton sheets and other cloth. 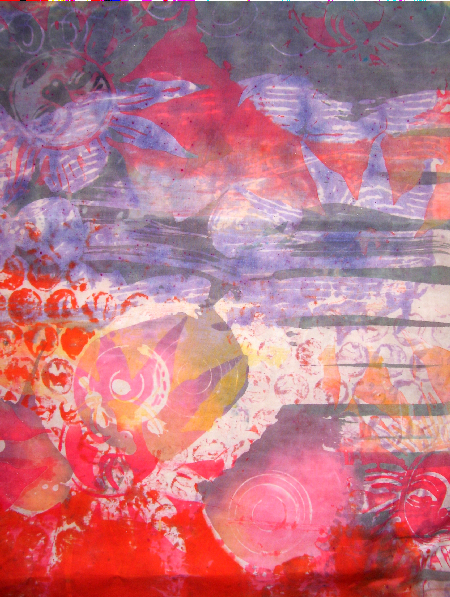 She alters the surface with batik, dye, stamps, stencils and screen print designs. A lot of her art cloth is what goes into her textile work. 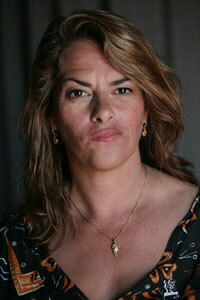 Emin was born in London in 1963 and studied at Maidstone College of Art and the Royal College of Art, London. She has exhibited her work in Holland Germany, Japan, Australia and America. She uses her life events as inspiration for her works which range from paintings, drawings and video to photography, needlework and sculpture. In her work she reveals to us her hopes, dreams, humiliations, failures and successes. At times her work can be frequently tragic and humorous at times. It is also extremely intimate and often sexually provocative.